Email marketing is essentially the online version of direct mail. Instead of sending fliers and coupons to a customer's home, email marketing can send those same items digitally to a customer's inbox. However, whereas the impact of direct-mail marketing can be difficult to track, email marketing gives businesses the chance to see exactly who is opening their mail and who is actually using and reading what's sent out. As with other forms of marketing, businesses owners can use email marketing in a variety of ways, from building brand loyalty and finding new customers to encouraging customer loyalty and repeat business. Because there are many different strategies and ways for email marketing to be used, every type of business — business-to-business or business-to-consumer — can find a way to include it in their overall marketing plan. Newsletters: These are a quick way to keep your customers informed on any business news or upcoming promotions. Newsletters are sent on a recurring basis, such as every week or every month. Promotional campaigns: These can be used to let customers know about upcoming sales. They can be sent in the days leading up to the sale, as well during the sale, as a reminder for customers. Invitation emails: These keep clients up-to-date on upcoming special events. Invitation emails can be sent weeks or days before an event occurs as a way to encourage a customer to attend. Catalog emails: These are sent out to highlight a specific product or service. The entire email is focused on that single item. Lead-nurturing emails: These are designed to keep your brand top-of-mind for a prospective client. They are sent out regularly until a potential customer is converted into a paying customers. Survey emails: These are sent as a way to learn more about your customers' needs and wants. Transactional emails: These are sent after a purchase is made, as a way to confirm the transaction and thank the customer. 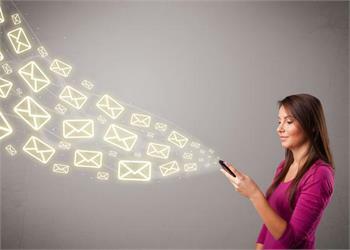 Email marketing offers businesses several advantages over other types of marketing strategies. Cost is a key differentiator, as email marketing doesn't require any printing or mailing fees. All of the emails can be sent for free, just like any other email. In addition, they can also be designed and sent in mere days, as opposed to direct mail, which can take weeks or months to plan and execute. Email marketing also provides businesses with greater tracking options. With email marketing software, a business owner can see which emails were received, which ones went to email addresses that were no longer active, which emails were opened, which ones were deleted before they were read and which ones enticed clients to click through to the website. The main drawback to email marketing is that many consumers can consider the emails as spam and hold it against a brand's reputation. If customers feel they are being bombarded by unwanted emails from a business, they will be less likely to become a new or repeat customer. An email marketing service provides all of the software and tools needed to create and execute email marketing campaigns. Specifically, they provide users with templates to design and create all types of email marketing campaigns. The design tools are created so that even those who don't have Web design experience can easily develop something eye-catching. Email marketing services also include features to collect and store customer email addresses, as well as keep track of what happens with each email that is sent out. The data and statistics provided by email marketing services make it simple to determine the success of a campaign. The services also provide the tools needed to send out a large number of emails at one time.